feel of this intro is curiously old-fashioned? rotating 'DHS' 3-D logo, although this is probably a pre-rendered animation. some horizontal starfields, complete with "what's next" infotext. 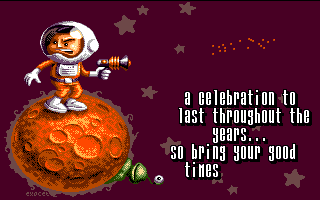 conclude, we get some greets, which are a repeat of the very first screen. get one of their old demo's out, this would hit the spot! Rated at:- 6 out of 10 - (Code) Partying like it is 1991! the only really ambitious ST-based 96ktro from this competition. of overlapping colour circles in the background, to immediately liven it up. distinguished zik-composing peers a decent run for their money. some bouncing rubber balls onscreen,  each with an MJJ member's names on it. These crowd out the screen, and overlap onto each other. cloud does its thing immediately after. semi-transparent infotext as it appears. of lava lamp look in places. direction are awaited with interest! Rated at:- 7 out of 10 - A good first step leading to some giant leaps? tune to go with them. the dot effect theme, such as solid vectors and large bobs. something with a bit more code to it! Rated at:- 7 out of 10 - Small but perfectly formed! but do vote for the stunning tune in the music compo instead! start to bite? Well they might mutate into a Gloky cat perhaps?! This one isn't reset proof by the way, I checked! Rated at:- 5 out of 10 - Nicely done, but a very slight production..